No town is an island. Actions taken in Woodstock are inextricably linked to events and activities in surrounding towns, throughout the Upper Valley and beyond. In recognition of this interconnectedness, Sustainable Woodstock (SW) works on initatives in a number of neighboring towns, including Barnard, Bridgewater, Pomfret and Reading. These partnerships range from promoting renewable energy and regional mass transportation options, to a low-income weatherization program that connects homeowners to programs, resources and financing for energy efficiency projects, in partnership with SEVCA, COVER Home Repair, the Ottauquechee Health Foundation and Efficiency Vermont. SW’s mission overlaps strongly with that of other sustainability organizations and government groups. The nearby Sustainable Hanover Committee works “to support the efforts of the community to assure that the Town of Hanover thrives for present and future generations.” SW has recently responded to a request from the nascent Sustainable Lebanon to help lay the groundwork for this new non-profit organization that will foster sustainable initiatives in a high-impact region of the Upper Valley. In addition to those groups already mentioned, Sustainable Woodstock partners with a number of other regional organizations, as well as local organizations with regional outreach. They include: Vital Communities, Two Rivers Ottauquechee Regional Commission, Connecticut River Conservancy, Pentangle Arts, Woodstock Rotary, Center for Transformational Practice, Upper Valley Solid Waste Management District, Change the World Kids, Ottauquechee Natural Resources Conservation District, Artistree, Billings Farm & Museum and the Marsh-Billings-Rockefeller National Historical Park. SW’s executive director has partnered on several programs with The Sustainability Project in Gilsum, NH, which was founded nearly 20 years ago: emersonbrookforest.org. Beyond the Upper Valley region, sustainability is being addressed by thousands of local, regional, national and international organizations. (This column recently featured an article written by Geoffrey Howard, board chair of Sustainable Warwick, New York.) There are 34 communities around the world named “Woodstock,” and a number of those communities engage in initiatives to help residents live sustainably. In September 2018, SW’s weekly Vermont Standard column was authored by Colin Carritt, the founder of Sustainable Woodstock in the UK, which is located in Oxfordshire, England (www.sustainablewoodstock.co.uk). The mission of SusWoo UK is “…to raise public awareness among the residents of Woodstock and beyond on the issues of climate change, energy conservation, waste reduction, recycling, bio-diversity, sustainable economics and respect for the planet.“ There is also a Sustainable Woodstock in Illinois (woodstockil.gov/environmental/page/sustainable-woodstock). 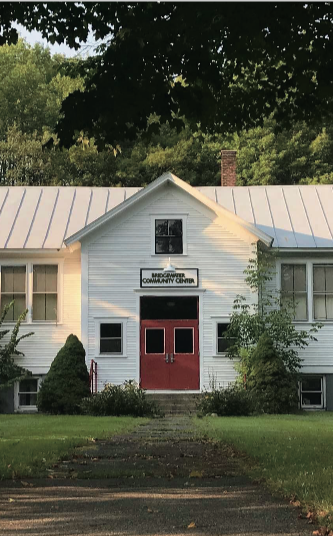 Sustainable Woodstock partnered with a number of local and regional individuals, businesses and organizations to assist the Bridgewater Area Community Foundation (BACF) in their successful campaign to save the Bridgewater Schoolhouse. SW staff took part in the visioning process and in creating plans for restoring the building as a vital community center, and we helped write and edit the organization’s first brochure. The building has recently been inspected and cleared for public use, including a day-care center. SW will soon begin discussions on making plans for retrofitting the building to serve as an emergency communty shelter, including renewable off-grid energy, water, food and bedding for when the next Tropical Storm Irene-level natural disaster strikes. Learn more by visiting the BACF website at: bridgewatercommunitycenter.org. In response to a critical need for mass transportation alternatives in the Upper Valley region, SW’s Energy Action Group added transportation to our mission. Our first goal is to work on connecting Hartford and Woodstock via public transportation options. We will promote the GO! Vermont project in coordination with the town of Hartford, Vital Communities and the Upper Valley Renewable Energy First—getting more people to sign up for this carpooling program. We will soon host a “launch” event in Woodstock or Hartford. At a recent meeting, the group decided to use the Go! Vermont app—an online ride-seeking tool that is being developed by the Vermont Agency of Transportation: connectingcommuters.org. In the first year since its inception in March of 2018, some 800 people have attended films in this series, which SW produces and publicizes in collaboration with Pentangle Arts. Films are chosen to highlight how local and regional actions impact the environment, communities and economies worldwide. Recent documentaries have included: “Mission Blue” (oceans), “Toxic Garbage Island” (plastic pollution), “Lobster War” (impacts of climate change on this fishery) and “Plastic Paradise: The Great Pacific Garbage Patch.” For a list of upcoming films, visit SW’s detailed online calendar listings: sustainablewoodstock.org/detailed-calendar-listings. Several years of research and networking by Sustainable Woodstock’s program coordinator, Zachariah Ralph, bore fruit in recent meetings, including an informational gathering and discussion attended by the Commissioner of Vermont’s Division of Forests, Parks and Recreation, Michael Snyder, as well as Stewardship Forester, Tim Morton. Our monthly Carbon Forest Action Group is attended by many local and regional foresters and others who are interested in managing our forests to mitigate climate change. Sustainable Woodstock is working on a Carbon Forest Initiative to explore managing several large tracts of public and private forests to store and sequester carbon, while ensuring that these forestlands remain active, vibrant components of Vermont’s sustainable forest products economy.